Before I begin I want to thank you for all the calls, texts, comments, messages, etc. I wish I could respond to each of them, but it’s just been too busy here in the ICU. I should also note that I am not allowed to talk on my cell phone in Jody’s room, and that is where I have been spending my time (there is no land line to his room either). I am so touched by your encouragement and I know Jody will be too. I can’t wait for him to read all the comments you left on my blog, thank you for doing so. After a ‘decent’ night of sleep, I’m ready to put Jody’s transplant story on paper (technically a computer screen). To make things easier on myself and to help Jody & I remember the details, I’ll put the events in a timeline. 3:35 pm: Received phone call from JH transplant coordinator of lungs for Jody. Told to leave ASAP. 4:20 pm: Left our house (needed to wait for someone to come take our daughters). 5:42 pm: Arrived at JHH after an uneventful drive. 6:15 pm: Taken to the ICU where he would remain for his pre-op period. We were told that surgery was scheduled for 9 pm. Here they started IV’s, drew labs, did a few other tests, and had him do his pre-op scrub down. 8:30 pm: Anesthesia consents were signed. 9:00 pm: Surgery consents were signed. 11:24 pm: Surgery began. The time between when he left for the OR and when surgery actually started was the time it took for anesthesia to place all the lines/tubes that he would need for this procedure (breathing tube, central lines, A-line, femoral line, etc.). 12:16 am: Jody’s new lungs arrived. 12:39 am: Left lung was being put in. 2:25 am: Both lungs were officially in (JODY GOT LUNGS)!!! 3:00 am: Dr. Shah, the transplant surgeon came out to talk to me and tell me how everything went, which was well. 3:35 am: Transferred out of the OR and into the ICU (exactly 12 hrs after receiving the call from home). 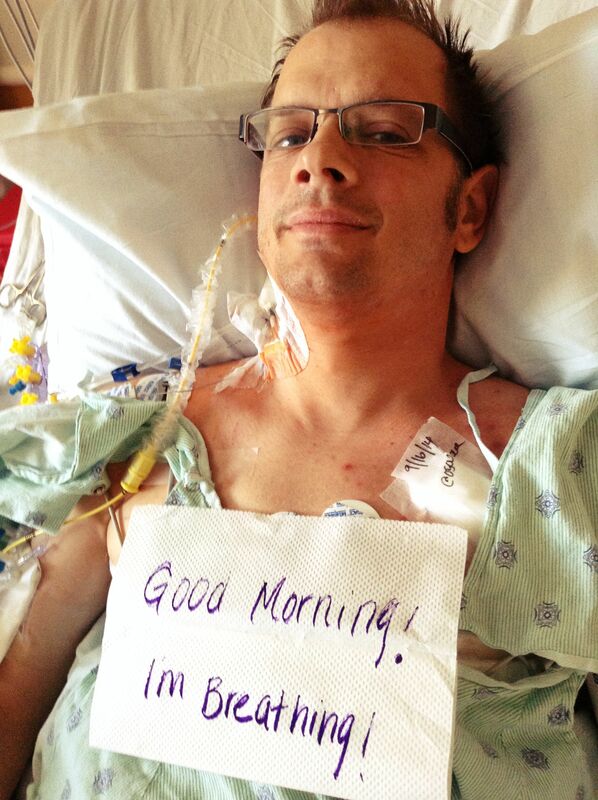 5:30 am: I returned to the ICU to see Jody for the first time post-operatively. When we got the call at home I wasn’t sure what to think, especially after the two previous calls which ended in dry runs (check out those posts if you haven’t read them, by clicking here & here). I honestly wasn’t as willing to believe that this was the real deal as I had been during the previous run. Jody, on the other hand, somehow knew this would be the one, and he was much more emotional about it, compared to the previous dry runs. Once the ball got rolling, the timeline of events seemed to progress rather quickly. You might think I’m crazy for this, but I purposefully chose to be by myself for the procedure. I didn’t know how I would react or respond and I didn’t want to feel like I needed to be strong for others or that I was entertaining people while I waited. I appreciated our family’s understanding of this. Since transplant happened in the middle of the night on a Sunday night, I had the entire waiting room to myself. The lights were dimmed, it was quiet and peaceful, it was just me, and it was great! Truthfully, I felt very calm. I knew that we were being covered in prayer by the few people who knew Jody had been called. I knew that Jody was in good hands with Dr. Shah and even better in the hands of The Great Physician Himself. For me, the most emotional time up to this point was after Jody left for the OR. I walked to the parking garage to drop off and pick up some things. While there I heard the incoming sound of the JH chopper. Instantly I knew it was carrying Jody’s lungs and I needed to see it! I went running, bags and things falling all over the garage, which thankfully wasn’t busy. As I watched the chopper land, and heard the loud roar of the engine & propellers, I became overcome with emotion. Suddenly I felt such intense grief for a family who, while we rejoice, are gathering to mourn the suddenly loss of a loved one (brings tears to my eyes even as I type this). How do you thank someone for a gift such as this? My feelings of grief were followed by joy, hope, fear, and nervousness, all rolled into one. I had my moment of tears, but as the chopper lifted back up minutes later, I wiped my tears, and carried on. In case you paid special attention to the timeline of events, you may have noticed that it turns out I was wrong about that chopper carrying Jody’s lungs. They didn’t arrive until 12:16 am! Either way, I believe God used that moment to help me feel a small fraction of what the donor family was feeling. Please, please, as you pray for Jody and his recovery, remember this giving and grieving family in your prayers too. It’s unbearable for me to think of what would have happened to Jody if new lungs never came and it hurts to know that another family is experiencing this pain in their hearts. The thing I was most nervous about following transplant was walking back to see Jody for the first time. I felt pretty prepared for all the equipment, but how do you prepare yourself to see a loved one lying still and helpless and on a breathing machine? I wasn’t prepared for what I saw. The gobs of lines, tubes, and machines had no effect on me. It was his face. I saw him from the door as I prepped to go in (donning gown, gloves and mask), and I felt like I’d just had the wind knocked out of me. He looked, putting it bluntly, dead. The color of his skin, the stillness of his body. My first thought was, “He looks like he’s lying in a coffin!” It took courage to bring myself to walk into his room. As I stood there, I couldn’t get past that thought, and I began to feel queasy so I grabbed a chair to sit down beside him. I must have done a good job of hiding my shock at how he looked because it went completely unnoticed by the nurse taking care of him (who was wonderful by the way). Honestly, it probably took a good hour until I could see past the ‘deadness’ in his face and skin, but thankfully, eventually I could. At this point in time Jody was completely and totally sedated. In fact, he still had paralytic agents in his body from surgery so he literally could not move. For many hours he laid there completely still and unaware of anything going on around him. Jody has what is termed a ‘clam shell’ incision, one that goes completely across his chest horizontally, instead of vertically as seen in heart surgery. The clam shell incision is known for being especially painful. For this reason, late morning yesterday they inserted an epidural catheter, much like women use for labor, only this numbs his upper chest. Once the catheter was in and Jody was receiving pain mediation to his incision they started to wake him. In order to start using those new lungs, he needed to be awake. It was around 11:30 am when they lowered the ventilator settings to allow Jody to do most of the work of breathing, and breathing he did. It was awesome! The unpleasant thing for him was being awake, tied down, and having a tube down his throat. He had been warned pre-operatively of the need to stay calm and not fight because it would only make it worse for him, and make the gagging sensation worse as well. Knowing and doing are two very different things. Throughout the day, this became the hardest thing to watch. He was so uncomfortable with that tube and all we could do was tell him over and over that he needs to relax and stay calm. I held his hand and rubbed his hair, doing the best I could to calm him down. It was miserable. There were times he looked at me like, “You have NO idea what this is like, I can’t do this.” I could see his frustration and how desperately he wanted that tube out… but his lungs weren’t ready yet. I truly cannot put into words how awful this part was for me. Over and over I wanted to weep and say, “I’m so so sorry you have to go through this (again the tears fill as I type).” I realized that this gift of life comes at a huge price for both the donor and the recipient. It’s no piece of cake! From a breathing stand point Jody was doing great, that was never an issue, thankfully. Initially Dr. Shah told me that they planned to remove the breathing tube today, and I wondered how we were going to make it until then. Jody’s nurse called me his “Professional Calmer Downer,” because he was much calmer when he could feel my touch. But how could I sit at his bedside all night (after already losing 24 hrs of sleep), and how could he endure it? They began testing Jody to see if he would be able to breathe completely on his own if they pulled the tube earlier than planned, and he passed with flying colors! At 4:35 pm they extubated him (removed the breathing tube), and it was instant relief for Jody. Do you want to know the first words he managed to faintly whisper? Of all the things he could have said, like, “I wanted you to stop telling me to relax,” or of all the things he could have complained about, such as pain, he instead chose three little yet powerful words, “I love you!” This speaks to his character. Jody had essentially been breathing on his own on the vent, but with the tube gone, it actually looked like he was breathing on his own. They put him on 2L of oxygen, not because he needed it but “just to make us (the team) feel better.” Remember, coming into the hospital he was on 6L of continuous O2 and was still short of breath. By 5:00 pm (only 25 minutes later) they removed the oxygen all together and he was breathing 100% on his own. It was amazing! His pulse ox started in the high 80’s and slowly increased to around 94-95% which is where it’s hanging right now. Next to the birth of my children, this was the most miraculous thing I’d ever seen! Someone else’s lungs, in him, breathing, on their own, just as they had done before. It worked!!! Jody no longer has scarred and failing lungs in him, but instead, strong, healthy ones! To see him off oxygen was… can’t even find the right word, only more tears. He has continued to breathe free of any assistance, and it’s breath-taking for me. Jody is doing amazingly well, but the journey is far from over. He has low blood pressure which they are working to improve. They want to keep his lungs dry so they need to avoid giving him fluids. Instead he’s on meds to improve his pressure and also got a few blood transfusions since surgery which has helped. One thing that is really bothering Jody is his dry mouth. He hasn’t been allowed any liquids, including ice chips because of the risk of aspiration into his new lungs. He will undergo a swallowing study this afternoon which will determine if he will be allowed to eat or drink. After being given medications which cause dry mouth, and his mouth hanging open throughout surgery and the entire time he had the breathing tube, I can’t imagine how parched he must feel. Please pray that God would take this feeling away from him and/or that he would pass his swallowing test when they are done. There is so much more I could share with you but I need to stop. I’m glad I could finally get this out to you. Today is a busy day for Jody and I will continue to update you when I can. Praising God for answered prayers, may He receive all the credit for Jody’s incredible progress! Tissue alert! This is truly amazing. Continued prayers for you, Jody and the rest of your family. Brings back so many memories. Last October we traveled down the same road with my dad. Very surreal time, and emotions were all over the place. I can’t express how overjoyed I am for Jody! The tears are streaming for me too. I remember the conversations that him and I had about this possible time in life and this very day! My prayers and blessings to Jody, Tiffany and all the family. I know his mom must be over the moon! Hugs to her too! God bless! I have been thinking of you non-stop since hearing you were getting your new lungs. Thank you so much Tiffany for taking the time to tell the story so far!! I will continue to keep all of you and the donor family in my prayers! Truly amazing!! Thank you Father for this amazing miracle!! So glad to hear Jody is doing well. Continuing to pray. Enjoying reading/hearing about this journey! Sending love & prayers. Absolutely amazing!!! I’m so happy to hear he is doing so well. I’m not going to lie, I shed a few tears reading this post. Mostly happy ones though. I can’t think of a better way to spend my lunch break than taking in all the experience you have poured into words so beautifully, Tiffany. I have just a few brief minutes left to share with you what is on my heart for your family now in this moment. Breath of heaven, hold Jody, Tiffany, and the girls together. Be forever near them, Breath of heaven. Lighten any darkness, pour over them Your holiness for You are holy, Breath of heaven. We offer all we are in our frail humanity for the mercy of Your plan. Help them be strong. Help them. And prick our hearts and minds to pray according to the Words You drop in our hearts for this dear family, for the continuation of their far-reaching testimony even to the family who had to part with one they loved so that this father and son can breathe You in, in a new way. Thank You for Your Presence and grace. May Your peace be in every detail. Thank You, victorious Lord. We humbly thank You for Your work in every step that today brings. Amen. The PTs from over here on Medicine are thinking about Jody and your whole family! Glad to hear he’s doing well! Thank you Tiffany for sharing the picture of Jody. I can’t tell you how much that means to my family to see him. Blessings and prayers to all of you and prayers to the family of the donor. So glad to hear Jody is doing so well! Been praying for him and will continue to pray! Wow! What an amazing story!! Oh Tiffany, this is the happiest blog I have ever read and still I’m crying. I felt every one of your tears while you watched him on that vent and every one of your happy tears when they pulled him off. It’s amazing, but Bob’s first words were to Robin and they were also “I love you”. How powerful are those 3 little words. I have prayed almost non stop since I first got your call. How great is our God?? It is amazing to see His hand in all of this. I too have prayed for the donor family and I have cried tears of sorrow for that unknown donor. But what a precious gift to give to Jody and to you and the girls. I will be sharing all of this with our small group tomorrow night and we will rejoice and give God all the thanks and praise for this miracle. Rest easy Tiffany, God has your back, and Jody’s lungs! Love you!! This has been an amazing testimony to the power of prayer. Throughout this journey, we have prayed over and with Jody at SMOG (Steady Men of God) Bible Study. We have laughed and cried awaiting this day. TRUST in Him. These are the words I am taking from the journey. God Bless You Jody (And your wife and children). Love You Brother!!! Tiffany & Jody, we are so thrilled for you! We will continue to pray for all of you, as well as the donor’s family. Miraculous indeed! Jody, it is amazing that you are breathing 100% on your own! Way to go! Tiffany, you are an amazing wife and encourager. You two were certainly meant for each other. Praying and thinking about you always! Oh my goodness. I am trying to put into words how I feel, but words seem so inadequate. SO many emotions flowed through me as I read this. Relief that Jody is on course, sadness for the family that lost a loved one, frightened for all of you while waiting for surgery to be over, thankfulness to our Lord for his goodness, and the amazing moment when Tiff saw the helicopter and thought it was Jody’s lungs arriving-unbelievable. Tiffany, thank you so much for your posts. Your ability to put into words the experiences you all have undergone over the years is priceless. I of course continue to pray for you all. Jody, you and Tiffany were strongly on my mind lately, (before this occurred). The news was, therefore, unbelievable and appreciated. Great to see your face and read your story and most recent note. How joyous! Thinking of you all and anxious to hear of your progress throughout your next journey. Tiffany and Jody I am so in awe of you both at this time! What an amazing gift you have received!!! Thank you Tiff for continuing to update us. Please know I am praying for your family!!! God Bless! You have a real gift in writing, Tiffany….I felt like I was feeling your emotions with you as I read through this! I’m thankful your husband is doing so well and will pray it continues. Also continuing to lift up the donor family. You are an amazing strong and steady support to your husband and it obviously means so much to him! Wow praise God!!!! Such an incredible journey and such an incredible miracle for Jody and your family! 2 years ago to this day my dad was in the ICU after an emergency heart surgery and I still vividly remember the first time walking into his room and seeing all those tubes including a breathing tube in his seemingly lifeless body. Thank you for sharing your story!! God is good!! I am praying for you and for the donor family as well. May God fill you all with His strength and with peace! I am so happy that things are going so well, and will continue to pray for all of you there at the hospital and for the girls at home with grandparents. God is Good! Thank you for your blog updates Tiffany. Jody’s story is so inspiring and I’m so moved by your devotion to not only your family, but also to educating us all about CF. I will continue to pray for Jody’s recovery. Glad to hear he is doing well. Can’t wait to see him on the volleyball court again. I remember Tiffany the sparkle you had in your eye when you first had “that look” when Jody would come to volleyball. Great to hear that the “magic sparkle” is still alive in your relationship. God is Great! This brings tears to my eyes as I read this! Tears of JOY for the two of you. What a roller coaster of emotions you guys have been on and what a great team the two of you are! Your writting is incredible and makes it feel like we were there with Jody and you through this miraculous journey. I’m so happy for your joy and will continue to pray for Jody’s healing. I’ve known Jody since kindergarten and we were quite close friends for many school aged years. I always admired his positive attitude, uplifting laugh, and inspiring smile. Continuing prayers and blessing! i couldn’t read your timeline fast enough. You are such a descriptive blogger, Tiffany. I could feel every emotion. By the time I got to the picture of Jody at the end I was sure I could hear the Angels singing!!!! Thanks for sharing the whole story. Sherri and I read it together and teared up along with your words. We will keep praying for comfort and healing. I’m looking forward to guys night at JHH when Jody can have visitors. We will try to behave ourselves and not get kicked out. 🙂 God bless you guys. Awesome! Praise god!! I’m glad to hear such awesome progress!! Great job Jody and Tiffany!! It’s hard to Imagine that much pain and joy wrapped into a few hours! Continued prayer for more great success!! Thank you so much for the update. We have been praying for Jody’s surgery and will continue to pray for his healing and for your family as you support Jody. When I saw your initial post 2 days ago James 1:12 came to my mind. Jody and Tiffany, thank you for remaining steadfast in your faith in the midst of such difficult circumstances and trails. Tiffany you are amazing…I cried the whole way through your post. I am so happy for the progress Jody is making and will continue to pray for you both through this journey. Continued prayers, hugs and thoughts! Hope the pain is managed properly, or the pain diminishes quickly for Jody and strength for more steps everyday. I love to see the smiles on pictures, even though you are smiling thru the pain. Strength for Tiffany too, and peaceful rest for both of you.